I stayed home sick on Monday, due to lingering nasty sinus problems. After the doctor’s office, grocery store, and pharmacy; it was time to make an easy and soothing dinner. I am not usually a meat person – I mostly stick with fish and eggs as far as animal proteins go. I prefer the beans and rice combination or soy products to meat. However, once in a blue moon, I will have chicken, as long as it is the Smart Chicken brand. You guessed it, Iowa chicken! I like my chickens free-range and happy before they died. But enough of my personal meat beliefs, without further ado, here is the concoction I whipped up. 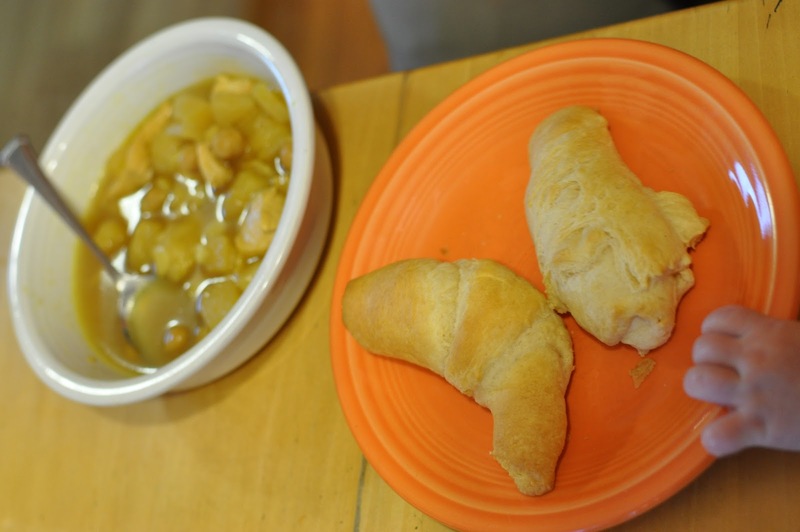 Slow-cooker Indian Soup with crescent rolls. Even Greta was interested. 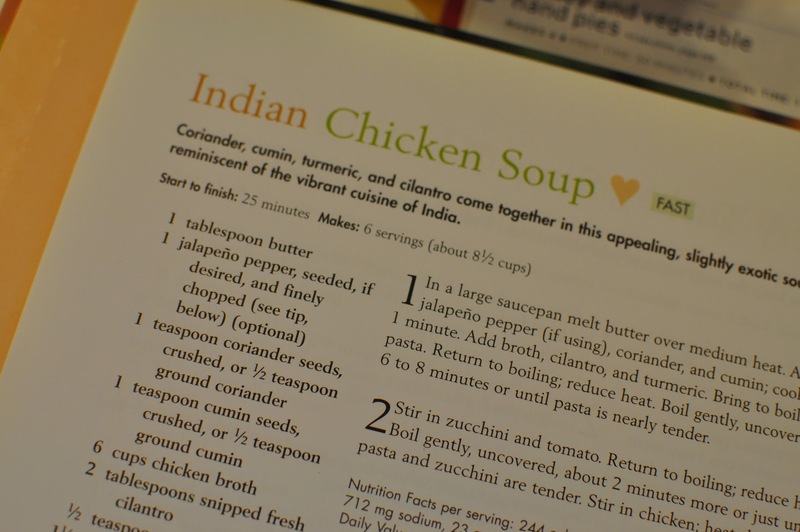 My inspiration came from a Better Homes & Gardens Soup cookbook. The actual recipe was made up as I cooked based on what I had sitting around and what sounded good. In a small saucepan, saute 2 tablespoons oil or margarine with 1 diced medium onion. Cook until onion is soft. 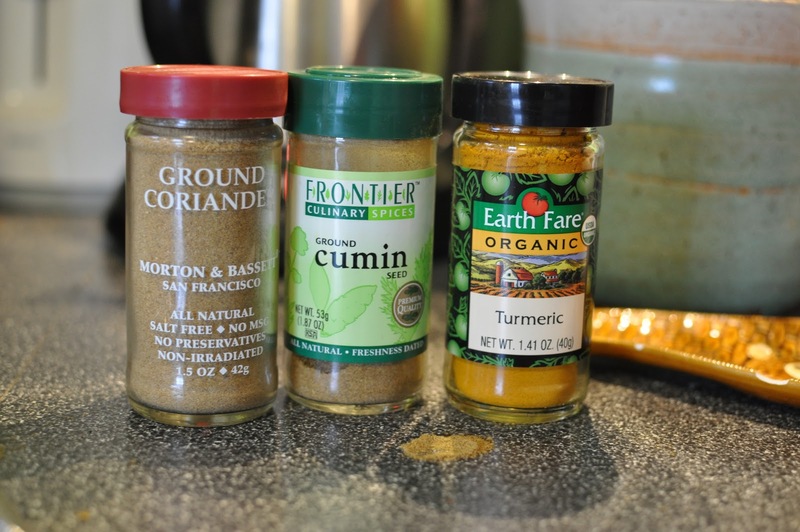 Add 1 teaspoon ground coriander, 1 teaspoon ground cumin, and 1 teaspoon turmeric. Mix well. 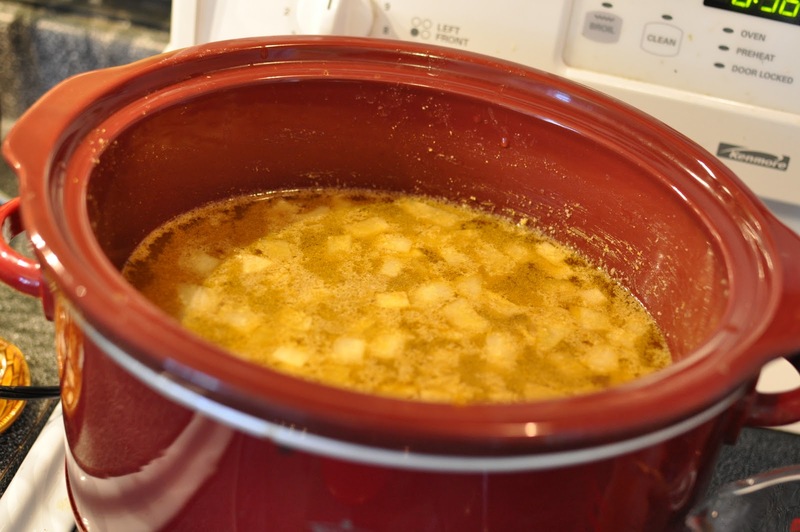 Combine onion mixture in slow cooker with 6 cups of vegetable or chicken broth. Add 1 baking potato, peeled and sliced into 1-inch cubes. Combine with 1 can of garbanzo beans. Simmer on high for 3 hours. Slice and remove seeds from 1 fresh chile pepper. Slice two chicken breasts into 1-inch cubes. Combine both with broth mixture. Simmer on high for 4 hours. Add 1-1/2 cups small pasta, such as small shells in last 1/2 hour.Serve with warm naan or the cheap way – crescent rolls. This soup did it for me – the spice, the peppers, and heat were the perfect way to feel better. Indian food has always been my comfort food. This soup is sure to be added to the heavy rotation recipes. 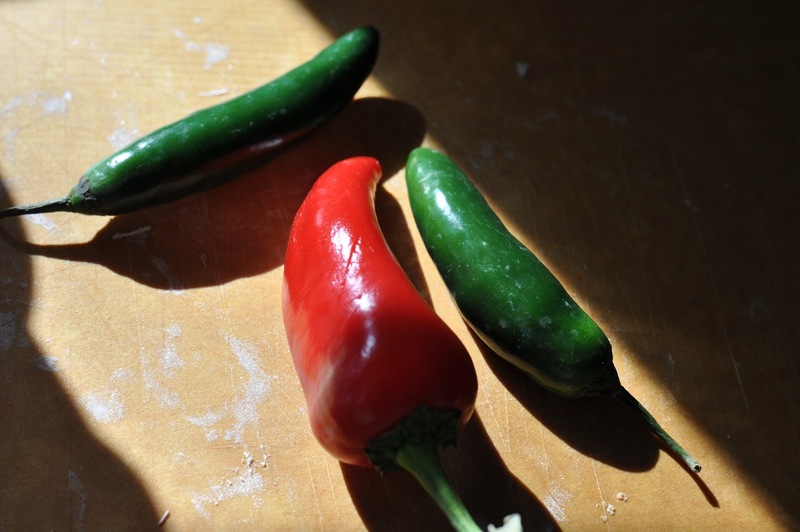 Slice and remove seeds from 1 fresh chile pepper. Slice two chicken breasts into 1-inch cubes. Combine both with broth mixture. Simmer on high for 4 hours.